There is a relationship, almost invariably overlooked, between the proposals of land-value tax as an economic policy, and proportional representation as a political policy. Both policies have, across the world, a diverse range of small and independent groups of advocates. These groups tend to be populated by didactic boffins, people with great expertise on matters of tax policy and electoral systems, two topics which traditionally bore normal people senseless. Yet the wisest among them understand their deep importance. For whilst the advocates of these policies have had difficulties in inspiring the public at large, they are founded in two-deeply seated principles that are widely shared; fairness and justice. These idea are worth exploring. "It [government] should be in miniature, an exact portrait of the people at large. It should think, feel, reason, and act like them. That it may be the interest of this Assembly to do strict justice at all times, it should be an equal representation, or in other words equal interest among the people should have equal interest in it." "A representative body is to the nation what a chart is for the physical configuration of its soil: in all its parts, and as a whole, the representative body should at all times present a reduced picture of the people, their opinions, aspirations, and wishes, and that presentation should bear the relative proportion to the original precisely." Even John Stuart Mill, who is usually considered a founder of representative government, wrote in his foundational essay on the subject: "Is it necessary that the minority should not even be heard? Nothing but habit and old association can reconcile any reasonable being to the needless injustice. In a really equal democracy, every or any section would be represented, not disproportionately, but proportionately." "As soon as land becomes private property, the landlord demands a share of almost all the produce which the labourer can either raise, or collect from it. His rent makes the first deduction from the produce of the labour which is employed upon the land." 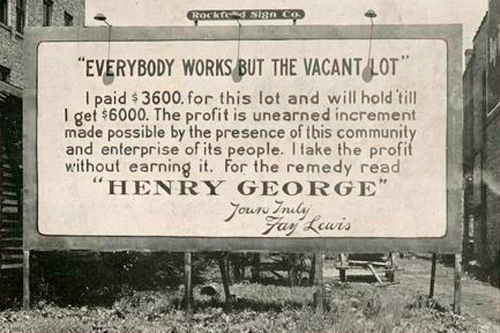 "Both ground-rents and the ordinary rent of land are a species of revenue which the owner, in many cases, enjoys without any care or attention of his own. Though a part of this revenue should be taken from him in order to defray the expenses of the state, no discouragement will thereby be given to any sort of industry. ... Ground-rents, and the ordinary rent of land, are therefore, perhaps, the species of revenue which can best bear to have a peculiar tax imposed upon them." These opinions found their way into common-sense economics. The notion of land was elaborated to mean all natural products, as consideration of the factors of production (land, labour, and capital) was developed, along with the returns from ownership of these factors (rent, wages, and profit), and the economic class of those owners (landlord, worker, capitalist). Note that an individual person can belong to all three classes simultaneously; they may receive rent in the form of increasing value in their real estate, they can receive wages for their work, they can receive interest on investments. In contemporary times, they could also receive a fiscal transfer from taxation of the factors of production to welfare as well, noting that all taxes - except those on economic land - have an additional deadweight cost due to a loss in trades . The primary problem confronting proportional representation has been the exclusion of people from democratic processes. For much of the modern period the main problem has not so much been about having a proportional say in governance, but to have any say at all. The fight to abolish slavery - still ongoing in some places - was a fight to ensure that human beings had at a minimal level of freedom. The campaign for universal suffrage - for women, to abolish landed property requirements - were all, indirectly, contributions to the long arc towards admitting the views of others to the body politic. The democratic revolutions of the late twentieth century that overthrew the Communist dictatorships of the Soviet Union and its satellites were also a contribution . Likewise electoral politics have very much taken a secondary position to the visceral concerns that come with the needs of positive and negative liberty - the right to have sufficient welfare and rights to be a genuine participant in society, and the right to be free from government or even social intervention in the private lives. Within democracies themselves however, proportional representation has been one of many electoral systems . First-past-the-post or plurarity systems with localised representation has ensured governance by the biggest minorities in the United States, the United Kingdom, Canada, and India. Preferential voting, alternate vote, or run-off elections have combined avoided the most odorous effects of first-past-the-post are have been implemented in Australia, France, etc. Proportional representation has been introduced to an extent in Australia (in Senate elections, in some state governments), and has mixed-member introductions with local representation in New Zealand and Germany, part-list systems in Russia and Brazil, or with large electorates (the Netherlands). In large electorate systems gerrymandering is reduced and, in all-encompassing electorates, impossible. However in almost all cases proportional representation has been simply a component by which a majoritarian position (50%+1 of the parliament) is sought. Only the Swiss have applied the model to their government itself with positions in their Federal Executive equal in proportion to the party vote . Nevertheless, in political theory as a whole the advocates of proportional representation have not been particularly numerous given the more pressing concerns. Only in the more narrow subset of those concerned with electoral systems within liberal democracies has their been strong advocacy, with leaders such as John Stuart Mill (again) and Thomas Hare in the UK, Helene Spence, and Andrew Inglis Clark (Australia), Victor D'Hondt in Belgium, André Sainte-Laguë in France, and Daniel Webster in the United States. One of the key features of electoral systems is that they tend to be very stable and only change in special and historic circumstances. In periods of revolutionary change it has been more typical for those acquiring power to establish systems for the new order. Thus it is typical that only been when there has been a multiplicity and coalition of new powers that anything approximating a pluralist democratic electoral system has been implemented. With regards to land tax, following Adam Smith in the field of economics it was strongly supported by David Ricardo who noted the negative association between rent and real wages, by John Stuart Mill who noted the distinction between private property in economic land and other (produced) property, by Henry George, who founded a global political and economic research movement ("the Single Tax") which persists to this day. The number of modern economists who support the land tax crosses the political spectrum; including Milton Freidman, James Buchanan Jnr, Robert Solow, Paul Samuelson, Herbert Simon, William Vickery, James Tobin, and Franco Modigliani - all supporters of the land tax. Most recently Joseph E. Stiglitz came out expressing the view that the implementation of land tax was one of the best means to fight inequality . Many countries have introduced land-taxes as part of a suite of taxation measures; however none have done so as the main source or sole source of public income. Where it is introduced as a major component has seen some excellent results. The Norwegian sovereign fund (Statens pensjonsfond Utland) for the North Sea oil reserves has created a situation where every Norwegian is effectively a millionaire - their biggest political problem at the moment is an abundance of wealth. In Botswana, the implementation of public ownership of substantial mineral resource values just after independence has led to this land-locked country from being the poorest to having highest GDP per capita in the region, the highest levels of literacy, and an extraordinarily long period of political stability in a region plagued by civil wars. Many other countries, instead of a land-tax, engaged (especially after revolutionary change) in the breaking up and redistribution of large land-holdings. The primary opponents of proportional representation in a democracy are those who benefit from plurality electoral systems. The crushing of the alternate vote referendum in the UK in 2011 is a particular case in point; both the Conservative Party and Labour benefited from a first-past-the-post system, whereas the Liberal Party, capable of achieving a quantity of votes far in excess of their actual representation, was left alone to campaign for a fairer electoral system. The majoritarian view was bizarrely helped by some far-left sociaist groups who apparently had forgotten how the Thatcher government relied upon the FTTP system. A common argument is based on the idea that proportional representation provides excess power to minority parties - for example in a three-way situation where the political distribution is 45%, 45%, and 10%, it is the 10% group that would determine government. A particular example given is Italy with Party-list proportional representation and changing alliances, resulting in significantly more governments than elections. Of course, this only applies in situations where government is determined by a 50%+1 model. In the Swiss example, from 1959 to 2003, the executive had exactly the same party composition. This requires, of course, a commitment to proportionality and collegiality which is largely missing in contemporary politics. The primary opponents of land-taxes are, of course, those who have extensive private ownership of natural resources and the monopoly rents that it generates. The Australian government discovered that they were not the true rulers of the country when mining companies put aside one hundred million in a campaign to scuttle a proposed mining tax on the economic rents of mineral resources; the government caved in after a mere 22 million was spent. Large landowners, often in a mix with resource capitalists, perpetuate a myth - also shared by Marxists - that land and capital are the same, and that economic land has no value unless labour and capital is added to it . If this was truly the case, an empty block would command no price. Others, doubtless well-intentioned, suggest that income should be the focus rather than wealth. It is bizarre when such opposition comes from self-described anarchists who are propping up the very foundation of the State (from estate), or from socialists who apparently have taken leave of any sort of class analysis in favour of emotivism. A proposal to base rates on income rather that site or property value neglects the prospect that ownership will be transferred to the poorest member of the family - with all the patriarchal implications that follow. It also concentrates on the immediate, rather than the flow-on effects of a public financing system which encourages productivity yet also and penalises resource usage. Finally, it does not account for the fact that appreciation in land-values is an income its own right, even if these are not immediately available. Land-tax advocates, it must be said, have not always done an excellent job are countering these propositions, and they are not helped by some of their strongest proponents showing exceptiopnal ignorance on the views of other economists . However there are two strong responses; firstly, the idea of land-tax for public income implies that individuals are entitled to a universal basic income - indeed, following Ricardo's Law, unless a UBI is funded through economic rents, proportionally those rents will simply increase to match the new income levels. Secondly, in those circumstances where the income is deferred - such as in the example of a owner-occupied property - the tax itself should also be deferred to the point of sale or transfer, or the death of the occupier . The weakness of PR and land tax advocates has been their limited scope and their strong desire within the groups for being "middle of the road". The proposals are radical, which would have fundamental changes to society, and they should have no shame in saying as such. Likewise, (like Henry George himself), they should also move to being advocates for as many improvements in worker's wages and conditions as possible. Whilst their concern is matters of the public sphere, existing commitments to political liberalism also need to be extended to contemporary civil rights campaigns. Finally, whilst they stand for fairness and justice, it must be understood that these are one and the same - and as result the separate organisations where they exist are more effective if combined. Larry Diamond and Marc F. Plattner (eds), "The global resurgence of democracy" (2nd edition), Johns Hopkins University Press, 1996. Known as the Zauberformel (French: formule magique, Italian: formula magica) or "Magic formula", this is an agreement to proportion to the seven executive seats of the Swiss Federal Council between the four ruling parties. Joseph Stiglitz, Interview with Christopher Williams, of the Robert Schalkenbach Foundation, October, 2002, published in Geophilos, Spring, 2003. The fact that every economist listed in the paragraph prior is a recepient of the Nobel Memorial Prize in Economic Science is, of course, purely coincidental. I give credit to Django Upton for the deferral proposal. Dan Sullivan's (April 2014) insistence of a appendix in Marx's Capital called "Agrarian Capitalism" and his refusal to admit this error indicates that he is much more of a liability than an asset to the Georgist cause. Commenting on this Story will be automatically closed on June 30, 2017.